I’ve designed the user experience strategy and web content interface for multinational corporate programs, driven inbound marketing campaigns for international product launches, built fully remote creative teams, and pitched both Fortune 100s and startups. I’ve been called a Brand Strategist, Creative Director, Instructional Designer, Communications Lead, and unicorn. I understand what makes business successful, marketing teams tick, and consumer hearts sing, and my commitment to measurable progress (for everyone involved) means that my work scales to create lasting impact. To me, marketing and brand strategy are a means to satisfy both strategic business goals and key customer needs. Trained in change management, Agile, and human-centered design, I’m best known for providing disruptive, data-driven solutions that address business challenges and growth initiatives. Develop a creative vision for how we'll use design and brand story to sway hearts and compel action—and find the core of the challenge we're facing. ...brands to create campaigns that move with content governance, strategy, and agile process. You have a creative concept, brand values to live by, and business goals that drive your approach, but you’re still missing the secret sauce (i.e. the strategic roadmap, digital strategy, content strategy, measurement framework, or maybe even the team) that will get you where you want to go. Working together to develop a strategic approach to your brand, content, and/or user experience challenge, we might work together on a single project, an entire product portfolio, or even a multiyear integrated marketing program. Here, I meet with startup founders in Silicon Valley, creatives in Utah, and developers in the Ukraine to discuss iterations and the go-to-market plan for our product launch. Photo courtesy Casa Kei in Puerto Escondido, Oaxaca. Because bold, innovative, customer-driven marketing doesn’t just happen. Elevating brand values to the forefront of our approach, creative consulting finds the core of your brand’s soul—and equips teams with the direction, tools, messages, and support to bring to life the brand story your shareholders, investors, partners, and even your parents can get behind. When things need to be shaken up, or already have been, we’ll work together to plot the best way forward. Ready? I am happy to speak, share, and workshop any of the topics listed to the right, in English, Spanish, or even Spanglish. 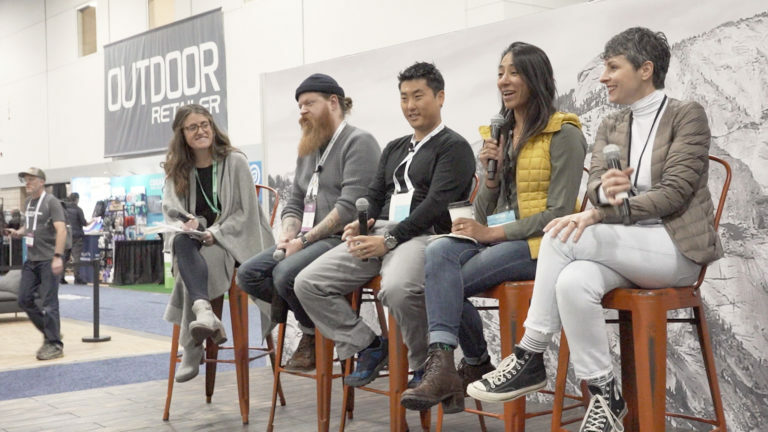 The "Authentic Activations" brand experience panel held at Outdoor Retailer's Winter '18 show. Photo credit Sonya Pevzner. Sharing "A New Paradigm for Parity," in 2018 at Zawadisha's Women as Changemakers event, where attendees explored the role intersectionality plays in consumer research and marketing. Photo credit Chelsea Jolly. Bridging Business Strategy with Marketing Goals for Scalable Impact: An exploration of how cross-channel content strategy plugs into the customer experience to inform marketing initiatives and internal team organization. The great outdoors inspire so much in all of us: they create community, beget belonging, and expose their own (and our) fragility. Grounded in an approach to create inspiring, measurable, consistent brand narratives, my work also seeks to positively impact the future of our public lands, our public health, and our community well-being. The way I am doing this—as an artistic activist for communities founded in outdoor adventures like surfing, rock climbing, and backcountry splitboarding—is to contribute my writing, impact marketing skills, stewardship labor, and team leadership skills to advocate for the environment. 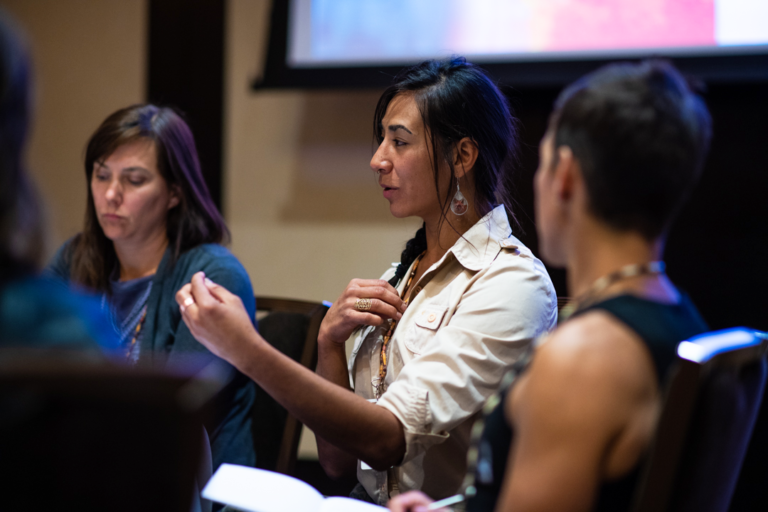 Grounded in the unshakeable belief that together, we can all create good in the world, my work as a community activist and public lands advocate looks like story that prioritizes inclusion, creates belonging, and drives the fundamental human need to understand identity. So: are you ready to shift the narrative? Pictured to the right: a spread from the 85 for 85 art activism fundraiser to protect and promote respectful visits to the Bears Ears-Grand Escalante National Monuments. Sign up for my mailing list to infrequent tips, videos, news, and resources . What is lacking in quantity will be made up for in quality, I promise.